It all starts with the serve. The serve is the only part of the game that you control totally, because you initiate the play. If you can’t get the serve to your opponents, you give them free points and you will not win the game. You can use several types of serves; Underarm, Sky Ball, Floater and Jump Serve. Face the net directly and standing just behind the back line take the ball in one hand, draw back your opposite hand while barely tossing the ball up, swing through contacting the ball. Face your target, hold the ball with your arm extended at your shoulder height, toss it a few feet above and slightly in front of your head, draw your other arm back and bring it forward to contact the middle of the ball with an open hand. Is essentially a 30-foot spike/hit where you set the ball to yourself with a toss. The toss should be far enough in front of you that you can make your normal spike/hit approach, also the toss has to be high enough to allow you time to run forward, plant your feet and contact the ball at the high point of your jump. Facing the sideline, with one of your shoulders closer to the net, the ball is held as in the underarm serve, using your legs is very important in this serve, since you want to almost jump into the ball to get more height. Ball control will win you more games than any other part of the game and the most fundamental skill involved is the pass. The first rule is to lock your forearms out by straightening your elbows and keep your forearms as tightly together as you can, your 2 separate forearms forming one flat platform, second key is the grip to keep your arms together. Contact the ball a little above your wrists on your forearms. Keep your feet a little wider than shoulder width apart with your knees bent. If you need to make few steps first to get to the ball, get there first, you don’t need to form the grip until you are near the ball, get directly behind the ball playing it at the centreline of your body. The set is the most elegant skill in volleyball. 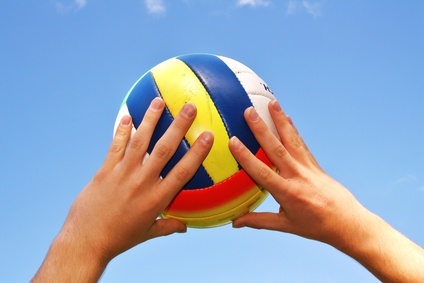 To see a heavy beach ball lifted softly with a feathery touch is a pretty sight, unfortunately the strict setting rules for the beach game discouraged many players from using their hands. Put your above your forehead so that they surround an imaginary ball, by pulling them apart, you create a little basket for the ball to fall into. Receive it with loose wrists and guide the ball up and forward. Bump setting is a little different from passing. When bump setting your arms should be almost parallel to the ground so that you get a direct lift on the ball, it will help to bend your knees a little more to get under the ball and set it above you. Attacking requires 3 basic elements: the approach, the jump, the contact. As soon as you pass the ball start moving towards the net, using as few steps as possible, 4 or 5 feet from your takeoff point, take one final powerful stride. Round up your approach a little to face the angle on your spike/hit. After the last stride plant both feet together for jump, while planting your arms should be swinging back and than towards as you lift off the ground. Jump straight up behind the ball while keeping it slightly in front of your body, drawing your hitting arm behind your head, contacting the ball with your whole hand as high as you can. While your knees are slightly bent and feet about shoulder width apart and put your hands at about head height. Watch the hitters approach. Crouch to get maximum jump and reach as high as you pushing your hands over and across the net. You should jump a little after the hitter does, the farther the hitter from the net, the later you should jump. 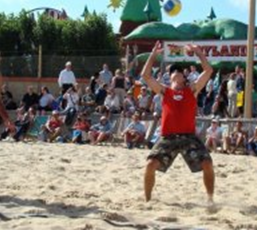 Beach volleyball players use hand signals to indicate the type of block they intend to make, also known as block signals. Block signals are made behind the back to hide them from the opposing team. They are usually given with both hands by the serving player’s partner prior to the serve, with each hand referring to the type of block that should be put up against an attack from the corresponding opponent. A player may also “wiggle” or “flash” one block signal to indicate which opponent to serve to. If the server is the designated blocker, he or she may run up to the net to block after serving. Otherwise, the signaling player will perform the block. Block signals may also be given during a rally while the opposing team is preparing their attack. 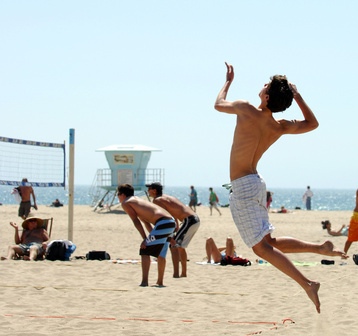 Beach volleyball is fundamentally similar to indoor volleyball: a team scores points by grounding the ball on the opponents’ court, or when the opposing team commits a fault (error or illegal action); teams can contact the ball no more than three times before the ball crosses the net; and consecutive contacts must be made by different players.